Tip & Techniques Installation Video - The following video will demonstrate the correct tips, tools and technique for correct rear bumper guard and bumper protector installation. The installation of bumper guards, door edge guards, and car door protectors is fast and easy. This video will cover the following information: surface preparation, measuring instructions. 1 " Front Bumper Guard Installation - 1" corner bumper guard and front bumper guard basic installation video covers proper surface preparation, measuring, masking and attachment instructions. Our installation video makes installing corner bumper guards and front bumper guards fast and easy. 1" front and rear bumper guards come in over 50+ colors. Our 1” height bumper protectors are great for hard to reach places under turn signals or headlights. Car bumper guards come in a variety of lengths and colors to best fit your vehicle. Not sure the quantity you need? Measure your bumper to determine the best bumper guard size and remember to order slightly more to account for trimmed edges. Most bumper protectors and bumper guards are available in 50 plus colors. These are the same car bumper guards, car door edge guards, vehicle door guards and bumper protector accessories you find at car dealerships at double the cost. Do it yourself and save $$$. Don’t settle for the bulky tank bumper guards you find at most car washes - these bumper guards are an eye sore and usually fall off after a few months. Our 1” bumper guards are premium quality bumper protectors and attach with a 3M adhesive backing. Also, our bumper guards are injected with color throughout, so you never have to worry about painting the cut ends. The bumper protectors you are viewing are 1” in height and 9.5 mm thick. Whether you are looking to protect your entire bumper or just the bumper corner, our 1” bumper protectors give you the flexibility to be creative and express yourself. We stock over 50 colors of bumper protectors, bumper guards and car door edge guards, so you can usually find a close match. We do recommend purchasing bumper guard color samples, since there are sometimes several shades of the same color. Installation of 1” bumper guards is easy, so you do not need to be a professional to attach them. We highly recommend using blue tape to mark the area before attaching the bumper protectors. This will allow you to adjust the line for a perfectly straight install. For more information about installing our bumper protectors, bumper guards and car door edge guards please view our install page. 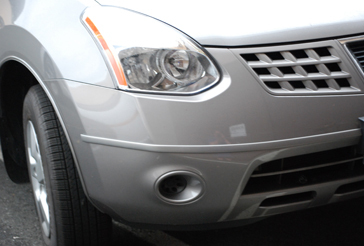 Our bumper protectors are the most effective way to protect your car bumper from the daily bumps and thumps of parking. Without bumper protection your car bumper is easily damaged when an adjacent vehicle parks in front or behind you. Available Colors - Over 50! Why Car Bumper Protection ? Is a Rear Bumper Protector Really Necessary ?